Mark Colvson joined the Sojourner Truth Library as Dean on July 9, 2012. 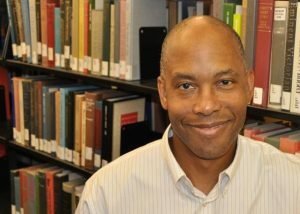 Previous experience: associate director of the James A. Cannavino Library at Marist College in Poughkeepsie, N.Y; associate director for library systems at the U. S. Military Academy at West Point; coordinator for curriculum and research support at Bryn Mawr College, Bryn Mawr, PA.
Convenes “Conversation One at New Paltz” an ongoing open conversation about the challenges of intolerance, exclusion, racism, sexism etc. Open to all – committed to working to better understand our biases and the ways we can help change the world one conversation at a time. Education: Bachelor of Arts degree in psychology from Haverford College (1981); Master of Library and Information Science from Drexel University (1989). “Click and Double-Click, the Podcast,” guest appearance, discussing podcasts, portable devices and ebooks – September 2005.